Do you love to try new things, or return to a classic favorite? 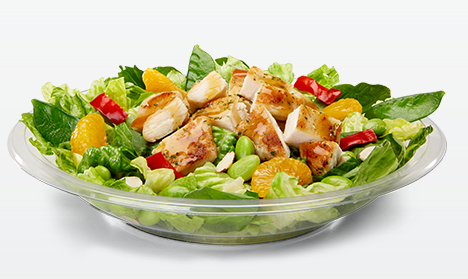 McDonald’s newly enhanced Asian Salad is a colorful mix of its new premium artisan grilled or crispy chicken, edamame, snow peas, red bell peppers, mandarin oranges, chopped Applewood smoked bacon and a bed of romaine lettuce, baby spinach and baby kale. The salad is accompanied by all-natural Newman’s Own® Lighten Up! ® Sesame Ginger salad dressing and a package of sliced and toasted almonds, on the side. "From edamame to mandarin oranges, each ingredient in the Asian Salad comes together to create an outstanding combination of tastes, colors and textures," says Chef Dan Coudreaut, Senior Director of Culinary Innovation, McDonald's USA. "The inspired, unique ingredients of the salad are beautifully balanced with Sesame Ginger Dressing to give our guests a refreshing experience that is on trend with their evolving tastes." 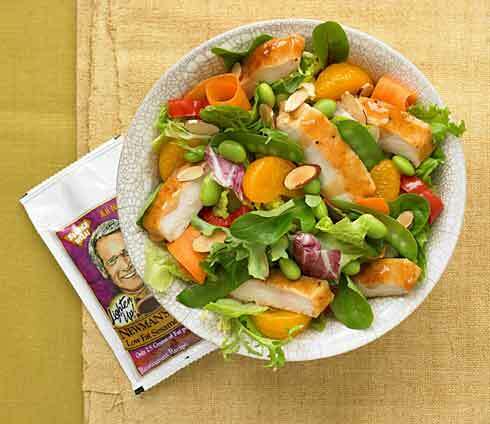 The Asian Salad with grilled chicken delivers about 360 calories when tossed in one packet of Newman's Own® Low Fat Sesame Ginger Dressing and customers can choose to have their salad without chicken for only 240 calories. The quality ingredients in McDonald's Premium Salads come from a select group of trusted, industry-leading suppliers. All of McDonald's Premium Salads are made fresh daily. 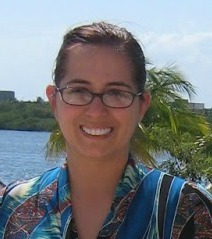 For more information about McDonald's full line of premium salads and menu choices visit www.mcdonalds.com/nutrition. The generous folks at McDonalds are offering One of Susan’s Disney Family readers a chance to win 5 Free Premium Salad coupons. Share the coupons with your friends and family, taste this fresh new salad for yourself! Coupons are valid at McDonald’s in Southeastern, PA, Southern NJ, Kent and New Castle Counties, DE. Coupons expire on 8/9/15. Please let me know who would love to try the NEW Premium Asian Salad at McDonald's?There are also other ways to enter, please enter below. I love McDonalds salads. I have my fingers crossed that I win . I would love to try their salads! I would love to try these new salads. My daughter and I would love to try these new salads. I love salads and my youngest son too. Me - I would love to try their salads! I'd love to try them, sounds delicious! My friend Amanda in Philadelphia would love to try these salads. I love salads and would like to try these. My husband, daughter and I would all love to try the salads. I would like to try this salad. My oldest daughter could eat them for every meal. My whole family and I would love to try them. My wife is always on a diet(even though she is not overweight), so she would love these. I would like to try them! My daughter and I would love to try these salads! My husband and I both would love these salads as summer is salad time for us. I would love to try these new salads! I want to try these salads since I haven't before. My sister would love to try these. My son would love to try these. He loves Salads. I would love to try these salads. I enjoy them a lot in the warmer months. I would love to try these new salads. I am trying to eat healthier. I enjoy McD salads! So glad that they are offering such good alternatives. I would love to try the salad. I would love to try these new salads after losing 25 lbs. this year and mostly eat salads. My husband would love to try these salads! I like their salads, pretty good if I say so myself. I would love to try these salads. I eat salads all the time! I would be the one who would love to try them. I love all types of salads. I would love to try these new salads because I happen to be dieting right now, just started and the salads would be great for me to eat ! I love salad anyway !! !